In 1998, The Department of Transportation put into effect Disadvantaged Business Goals of 10% for all Highway Projects that are paid for with federal grants. The result is a state DBE program that must follow Federal Regulations on its certification practices in order to receive Federal Highway Dollars. Very similar to the DBE Certification, the ACDBE Certification has goals set forth by the Federal Department of Transportation. However, ACDBE focuses on minority and women inclusiveness in airport concessions. A preference is obtained in the award of airport contracts (mostly leases) with airports which receive Federal Transportation Grant money, which is virtually any airport of noteworthy size in the United States. 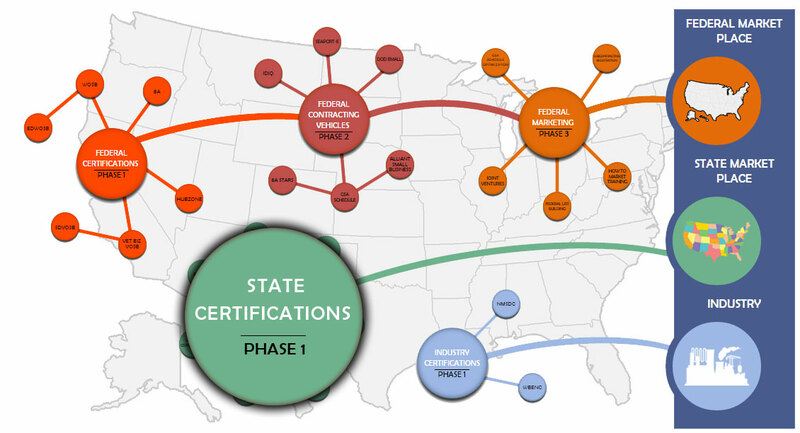 The MBE Certification (Minority Business Enterprise) varies greatly from state to state. States set procurement targets ranging from 5%-30% for all spending going to firms with MBE Certifications. The WBE Certification (Woman Business Enterprise) also varies greatly from state to state. States do set procurement targets, however WBEs are sometimes treated as MBEs utilizing the same bucket of state funds (in this case the certification is generally called a WMBE). Other times they access buckets specifically set aside for WBE Certification Holders. There are certain states that have adopted a preference for veteran and service disabled veteran owned firms. The greatest advantage for a Veteran Owned firm is in states where these firms are treated the same as MBE Certified Firms. However, there are some states though where Veteran certified firms receive a designation that only gives them an advantage in the case of a tie in a bid award. Some Cities and Municipalities have their own certification body. In these locations, such as New York City, the city can actually have a larger budget than the state. These certifications can cover different elements, but it’s important to obtain all certifications if possible at one time, taking advantage of instances of reciprocity between applications.